Are you an Epson color-printer user? Have you ever noticed how fast your ink cartridge runs out even though you haven’t printed enough color work from these cassettes? Each charge cost around PhP450 x 4 cartridges = Pain in the wallet. Back in 2007 when my wife and I were preparing for our wedding day, we made our entire 150+ invitations out of an Epson Photo Stylus Printer. I only used up three to four cartridges per color. We printed the invites, the name cards, personalized wedding vows, and signboards, however, I only printed no more than fifteen letter-size color outputs from these cartridges using my Epson Stylus TX110. 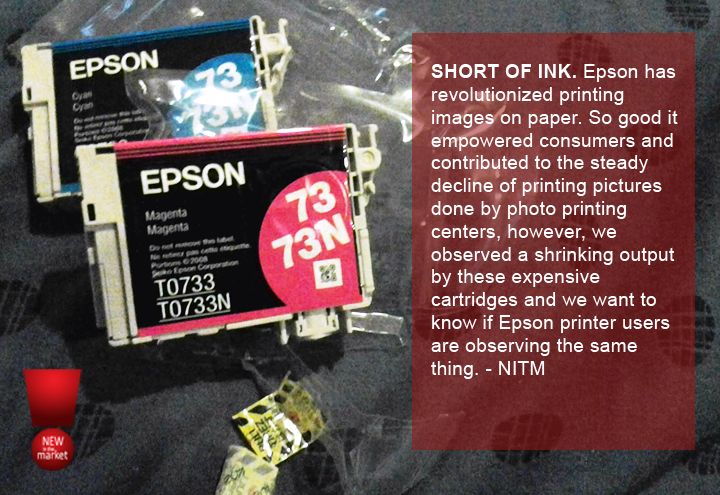 Are you a long-time Epson printer user? Have you noticed the same drop in the number of outputs? Do you notice how fast the ink cartridges fall to its empty levels after applying a printer head cleaning round? What’s your insight? Epson needs to know because buying ink cartridges is no joke.